Every year, the Allentown Police Athletic League continues to provide sports camps and activities throughout the Allentown area. From basketball leagues, to bowling, to Camp Blue-line, to scholarships PAL creates an environment, which promotes healthy sportsmanship for today's youth. of your donation goes to our youth programs! will benefit from our programs - thank you! Police Athletic League Inc Of Allentown Pa.
PAL is now on Facebook! 2013 WLVT Channel 39 spotlight on PAL. 2016-Chief Keith Morris and PAL Board Chairman Bill Holler receive a donation from the Lehigh Valley Phantoms representative Jeff Rogers. 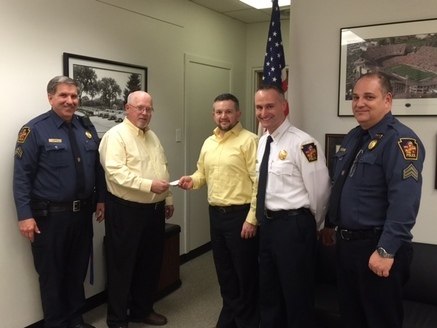 The donation was from the Guns N hoses hockey event which was previously held and sponsored by the Lehigh Valley Phantoms in support of the Allentown Police Department and Allentown Police Athletic League, coordinated by Allentown Detective Ray Ferraro. Sgt John Guido-PAL Activities Director, Bill Holler-PAL Board Chairman, Jeff Rogers-Vice President of Finance Lehigh Valley Phantoms, Allentown Police Chief Keith Morris and James Gress-PAL treasurer and Board Member. 2016-Chief Keith Morris receives a check for $560 for the Gerald M. Monahan Scholarship from Janice Rodgers, daughter of Gerald M Monahan. The Monahan family does an annual family fundraiser each year to continue the scholarship fund for high school seniors and college students interested in a criminal justice degree. A/C Gail Struss, Chief Morris, Janice Rodgers, Sgt John Guido-PAL Activities Director, A/C Glen Dorney. 2013-PAL Board Chairman Bill Holler and PAL Activities Director Sergeant John Guido presenting a golf shirt and Mug to Mayor Pawlowski for his support for the 2013 PAL Golf Tournament recently held at the Allentown Municipal Golf Course. 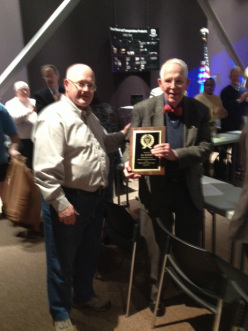 2013-PAL Board Chairman Bill Holler presenting a thank you plaque to AL Raber for his many years of service to the police athletic league and being the announcer for the July 4th fireworks. Al "officially" retired from the fireworks this past 4th of July 2012. Al has been with PAL for 38 years.